Store International How Fixed is a Permanent Establishment? 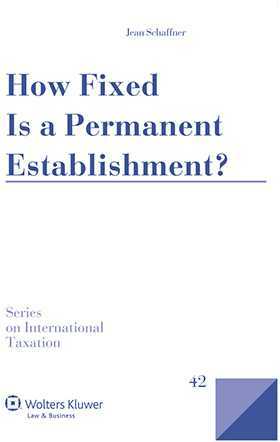 Permanent establishment is the key concept for allocating taxation rights in respect of business income, and the question ‘Is there a permanent establishment?’ is a tax treaty issue that advisers, government officials, and courts perennially confront. Based on a ‘fixed link to the ground’, the idea has become progressively more difficult to apply until, at this stage, re-evaluation has become a political necessity. If a permanent establishment may exist in the context of e-commerce, the concept of a geographical presence must be redefined. However, the question remains: Is e-commerce a sufficient reason for challenging the well-established permanent establishment nexus? and specific exceptions (e.g., transportation, artists and sportsmen, rental income, agricultural activities, pipelines). Taking into account important distinctions between two model conventions (OECD and UN), as well as pertinent EU directives and the impact of EU law, the author proposes minor amendments to the OECD Model that adapt it to economic reality and current trends in jurisprudence and that can be implemented immediately. An appendix includes Article 5 and its commentaries as they have evolved since 1963, with the successive addenda and deletions. The author’s 20-plus years of experience as a tax lawyer lend the presentation a thoroughly practical aspect. The work addresses in more detail than any other publication the topic of profit allocation to a permanent establishment in the e-commerce world, an issue which is evolving rapidly in the current economic environment. Chapter 1. The Roots of International Tax Law and the Permanent Establishment Concept. Chapter 2. Historic Evolution of the Permanent Establishment Concept. Chapter 3. Recent Developments of the Concept of Permanent Establishment. Chapter 4. The Geographical Location and the Basic Definition: The Physical Permanent Establishment. Chapter 5. Construction Permanent Establishments. Chapter 6. Preparatory or Auxiliary Activities. Chapter 7 . Agency Permanent Establishment. Chapter 8. Conclusion on the Territorial Location. Appendix: Proposed Changes to the Commentaries of Article 5.